historic site in Cavendish on Prince Edward Island. Bright sunlight streaming in through the skylight above the bed woke us up this morning. Looked as though the worst of the rain was over! We packed up the camper after breakfast and headed out to explore the island. The only nagging thought in the back of our minds, is we really wanted to make it to Grand Manan Island in New Brunswick in the next few days and we still had some ground to cover before we reached that area of the province. Regardless, we headed off to explore Prince Edward Island but as the day progressed, the weather deteriorated. 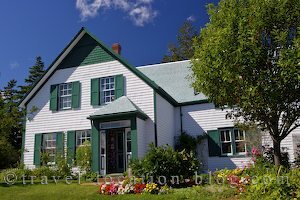 We spent some time at Lucy Maud Montgomery's home in Cavendish, a Canadian National Historic Site, then skirted the northern shores of the island. Bright coloured lobster fishing boats line the wharf of the North Rustico Harbour, with their pots stacked neatly beside the fishing stages. North Rustico village is a popular summer time destination and during the height of summer the population of the small village swells with visitors from around the globe and non resident property owners. By early afternoon, the odd drop of rain could be felt a warning that the weather was turning bad again. Over a lobster meal in Covehead, we made an executive decision to return to the mainland and start heading for Grand Manan Island. It was still a couple of days away but the forecast for P.E.I. wasn't looking good so we decided to cut our loses. We headed back to Borden-Carleton, passing through lush green rolling countryside, and productive farmland with patches of the island's rich red soil exposed. We stopped for a picture of the Confederation Bridge - a 13 kilometre long bridge which crosses the Northumberland Strait (taking approximately 10 minutes). Paying the toll charge to enable our passage back to the mainland, we headed over the bridge and drove straight for Hopewell Cape and a campground we'd stayed at at the very beginning of our trip - Ponderosa Pines. So we'd done full circle since May 29th. Tomorrow our plans would include a visit to the famous Hopewell Rocks which are located one kilometre from the campground.